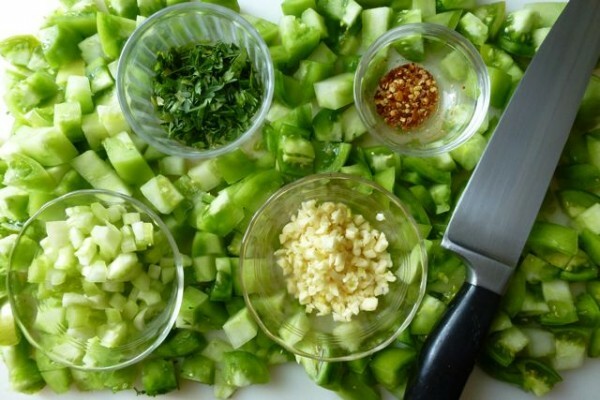 Chopped green tomatoes are seasoned with parsley, hot pepper flakes, garlic, celery, and olive oil in this unusual pasta sauce. Since I wrote about Miriam Rubin’s delightful cookbook Tomatoes back in May, I’ve been intending to try her recipe for Green Tomato Pasta Sauce from the region of Abruzzo. I was intrigued because I’d never eaten anything like it or even seen a recipe for an unripe tomato sauce. I panicked recently when the weather forecast predicted an overnight frost. I hadn’t tried the green tomato dish and time was running out. 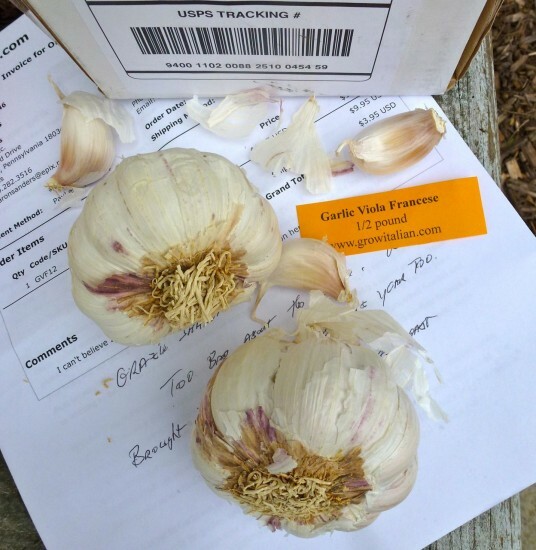 Unlike Rubin, who is a dedicated home vegetable grower and pens the “Miriam’s Garden” column for the Pittsburgh Post Gazette, I do not have a patch from which to pluck tomatoes. 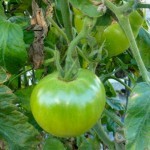 A generous gardening friend donated some green fruit to enable the test. The sauce is easy to prepare. It’s a lively blending of tart fruit, hot pepper, rich olive oil, and plenty of garlic. I believe it would be a good recipe to use in the winter months with pale, firm supermarket tomatoes. I’m going to give that a try, too. 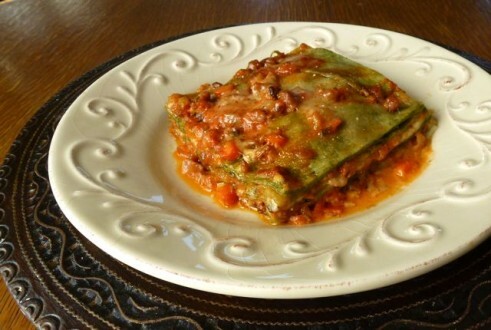 I’m curious if any SimpleItaly readers have relatives or friends who live in, or are from, Abruzzo who prepare a similar sauce. Please share a Comment if you do. 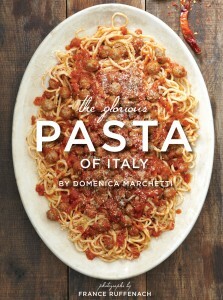 As I meandered through the recipes of The Glorious Pasta of Italy by Domenica Marchetti, with France Ruffenach’s sensual photographs, my appetite revved from 0 to 60 in no time. Mafalde with Roasted Tomatoes, Robiola, and Crushed Fennel Seeds? Maccheroni alla Chitarra with Ragù all’Abruzzese and Palottine? The Candy-Wrapped Tortelli with Rainbow Chard and Ricotta (whimsically named because the pasta is twisted to resemble hard candy wrappers)? Bigoli with Spicy Sardine Sauce? Turns out—none of the above. The answer presented itself definitively on page 127: Spaghetti al Farouk. It wasn’t only the spaghetti, cream, seafood, and saffron that got to me. It was the charming anecdote that seasoned the dish. The story behind the pasta reminded me of the scene in Fellini’s Amacord where the Middle Eastern potentate arrives at the Grand Hotel with his harem. Domenica describes is like this. . .
“This is a unique dish, and one that is near and dear to my heart. 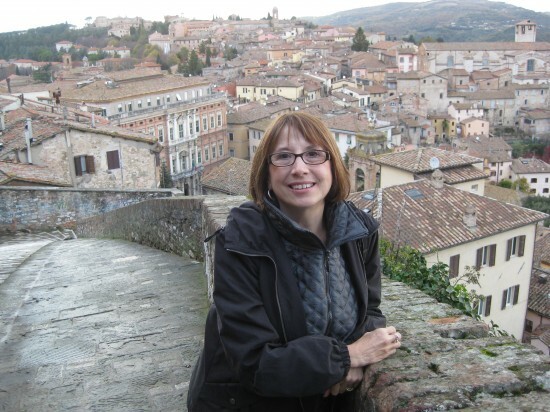 When I was a girl, my family owned a beach house on Abruzzo’s Adriatic coast. I have many wonderful memories of whiling away summer days on the beach with friends and enjoying late-night marathon meals that featured freshly caught local seafood. One of our favorite restaurants was right on the beach. 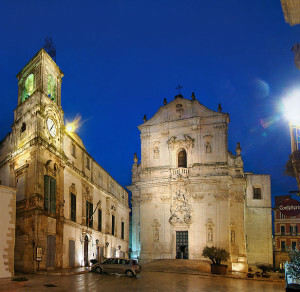 My memory says it was on the outskirts of the port city of Pescara, but my mother swears it was in nearby Francavilla. Since she is originally from the region, I will defer to her on that detail. Neither of us remembers the name of the restaurant, but we do remember that it was a casual place with a reputation for impeccable fish and seafood. One of its signature dishes was Spaghetti al Farouk, a fanciful curried pasta dish that brimmed with fresh mussels, shrimp/prawns, and pannocchie (something like crayfish or tiny lobsters.) The dish was named for the deposed Egyptian king who fled to Italy in 1952, and the sauce was spicy, silky, and a deep gold. My mother re-created the recipe in her own kitchen in the 1970s, and I still have a typed copy that she gave me. I’ve tinkered with the sauce over the years, lightening it a bit and trying different quantities of the various spices. In all honesty, I can’t tell you whether it is anything like the original—it’s been some thirty years—but I can tell you that it is a sauce like no other. In a frying pan large enough to hold all of the seafood, warm the olive oil and butter over medium heat. When the butter is melted and begins to sizzle, add the onion and stir to coat with the oil and butter. Sauté, stirring frequently, for about 7 minutes, or until the onion is softened but not browned. Stir in the saffron, curry powder, ginger, thyme, bay leaf, salt, and a generous grind of pepper, taking care to incorporate all of the herbs and spices. Stir in the lemon juice, raise the heat to medium-high, and pour in the wine. Let the sauce simmer briskly for about 3 minutes, or until slightly thickened. Reduce the heat to medium and stir in the cream. Bring the sauce back to a very gentle simmer. If the pasta water is not yet boiling, reduce the heat under the sauce to low and wait until the pasta water boils. Add the pasta to the boiling water, stir to separate the noodles, and cook according to the manufacturer’s instructions until al dente. Once the pasta is in the water, proceed with finishing the sauce. Add the mussels, shrimp/prawns, and langoustine tails to the simmering sauce, cover, and cook for 5 to 8 minutes, or until the mussels open, the shrimp/prawns are just cooked through, and the langoustine tails are heated through. Discard any mussels that failed to open. Drain the pasta into a colander set in the sink, reserving about 1 cup/240ml of the cooking water. If the frying pan is large enough to contain both the pasta and the sauce, add the pasta to the frying pan and gently toss the pasta and sauce to combine thoroughly, adding a splash or two of the cooking water if necessary to loosen the sauce. If the frying pan is not large enough, return the pasta to the pot, add about two-thirds of the sauce, toss to combine thoroughly, and then top with the remaining sauce when serving. Transfer the dressed pasta to a warmed serving bowl or shallow individual bowls. If you are preparing individual servings, be sure to divide the seafood evenly among them. Serve immediately. Beautiful red-gold saffron threads (zafferano) are the dried stigmas of the purple-striped flowers of the Crocus sativus plant. Saffron from Abruzzo’s Navelli plain is among the best in the world. The spice is sold in two forms, powder and threads. The powder dissolves more easily, but it is also more easily tampered with. To be sure you are getting pure saffron, buy the threads and gently pound them to a powder before using. I use a mortar and pestle for pounding, but you can also press down on the threads with a heavy object, such as the flat side of a meat pounder or mallet. Much of the shellfish available these days is farm raised and therefore contains less dirt and grit than shellfish harvested from the wild. To clean mussels, scrub their shells with a stiff brush under cold running water. Discard any that do not close tightly when handled. If the mussels have beards, the fibrous tufts they use to hold on to pilings and rocks, you need to remove them. Using a towel or just bare fingers, grasp the beard gently but firmly and yank it toward the shell’s hinge. This will remove the fibers without tearing the mussel meat. Frozen langoustine tails lack the flavor of fresh ones, but they are much more readily available and they have a nice, meaty texture that captures the sauce and absorbs its flavor. 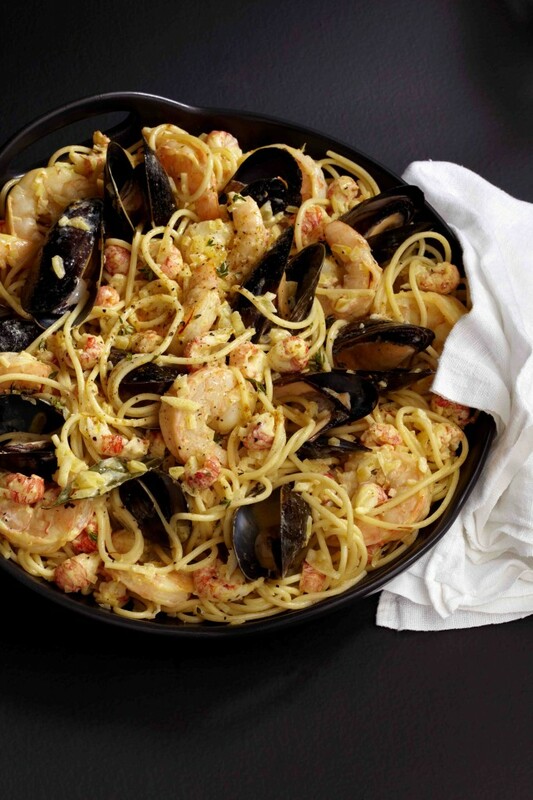 Linguine al limone is a silken melange that complements grilled summer seafood. She had me at “limone.” That’s because lemon is perhaps the best flavor on the planet. When Sara posted a comment longing for a recipe for chitarra al limone she ate in Sulmona, she set me on a delectable sleuthing mission. It was very very light and I don’t remember that it was creamy, buttery or eggy. It was as if essence of lemon and very little else coated each strand… I’ve tried just olive oil and lemon with a touch of cream but that just wasn’t the same. Armed with these clues, I speculated that the dish had to contain cheese, probably Parmigiano-Reggiano, to counter the tartness of the lemon and help create the luxurious mouth feel that she described. I’m thinking that Sara’s signora wasn’t being coy when she said “solo limone.” To her, cheese is probably just a “given” not worth mentioning. I consulted the usual reference suspects: Ada Boni’s Italian Regional Cooking, Le Ricette Regionali Italiane (Solares), Artusi’s The Art of Eating Well, The Ultimate Italian Cookbook by Carla Capalbo and Marcella’s Italian Kitchen. None offers a recipe for chitarra al limone. 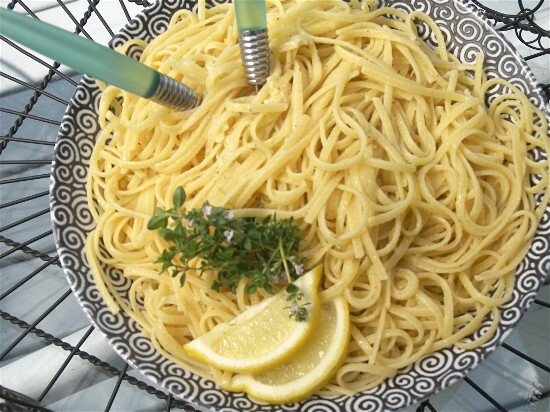 Giuliano Bugialli’s Bugialli on Pasta has a Spaghetti al Limone recipe “from all over Italy” containing quite a bit of butter and cream, more of a lemon- flavored cream sauce than the intense lemon sauce desired by Sara. Michele Scicolone has a Linguine with Lemon recipe in 1,000 Italian Recipes but it’s made with butter. For an Abruzzese dish, I felt that olive oil would be more traditional.